Upper deck external cabins have a double or twin beds (some with extra bed)‚ individually–controlled air conditioning‚ TV‚ mini–fridge and shower room with integral hairdryer. Prices are based on 2 adults sharing on Full Board or All Inclusive. A limited number of upper deck external cabins for sole use and upper deck external suites (with king–size bed) are available at a supplement. 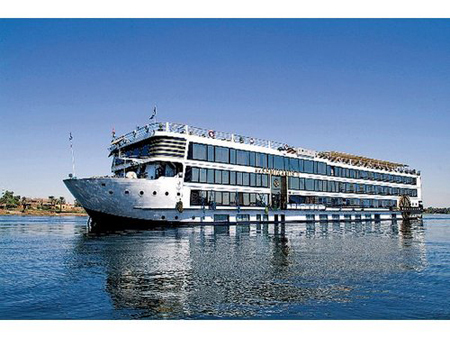 Discover the secrets of ancient Egypt as you cruise down the Nile. You will be met on arrival at Luxor airport and taken to your chosen cruise ship. Dinner will be served on board. Overnight on board in Luxor. Temples. Lunch and dinner served on board. Overnight on board in Luxor. dinner will be served on board. Sail to Edfu. Overnight on board in Edfu. board. Sail to Aswan. Overnight on board in Aswan. Unfinished Obelisk and Philae Temple. Panoramic sailing on board a felucca passing the Aga Khan's Mausoleum, followed by a visit to the Botanical Gardens. In the afternoon there is an optional city tour of Aswan. Lunch and dinner served on board. Overnight on board in Aswan. board. Overnight on board in Edfu. Breakfast on board. Morning sailing to Luxor. Lunch and dinner served on board. chosen hotel for the remainder of your holiday. 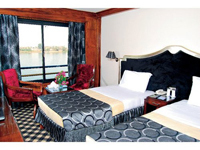 Please note: Nile cruises are not suitable for those with walking difficulties. booking All Inclusive on your chosen boat.